What differentiates a Lean thinking organization from a traditional one? Basically, the Lean thinking organization is grounded in the answers to two simple questions, “What do my customers value?” And, “What organization and work processes inside my company will most directly deliver that value?” Answering these two questions through a value-added perspective will help you determine how to structure your work, how to create and share information, and how to measure the performance of the key elements of lean thinking organizational redesign. Lean Thinking demands that an organization look at work differently than the traditional approach. Employees in lean organizations think of themselves as part of a linked chain of operations and decision-making points that continuously deliver value to customers whenever the customer request it. In a lean environment people understand how their work relates to the rest of the organization and to the customer. They understand how work is supposed to flow, and how to best utilize their time to minimize or eliminate non-value-added activity (policies, procedures, practices, etc. ), so that it does not slow down delivery to the customer. The lean company makes the flow of work from start to finish visible to all employees. They invest in this understanding with thorough training and cross training. Employees understand how policies and procedures in one part of the organization influence work in other parts. The all-important metric in Lean thinking is time. A lean organization structures work for time reduction. Management concentrates on flowing work continuously. By creating a smoother, uninterrupted flow, they can reduce the cycle time of the entire value stream, thus increasing throughput capacity. Traditional organizations usually manage only the cycle times of their bottleneck operations and neglect the less obvious or hidden operations. These companies allow decisions to pile up between phases and leaving feedback loops that should be customarily closed to remain open. All this interrupt the flow of work and lengthens customer lead time. As a result, time is wasted, and costs increase. Experience across both manufacturing and service industries indicates that less than 5% of the total lead time spent providing a product or service is value-added. Lean organizations consider where to place responsibility for results and how to co-locate or reposition people and resources to close the white space common in big organizations. They think about balancing the flow of work upstream and downstream, making allowances for how changes in customer demand or product mix will affect this workload balance. Lean thinking companies create more pertinent information and data and share it instinctively. A company seeking to respond quickly to its customers creates fast response among its employees. Work of any kind, whether it’s in a financial services company or on the shop floor, is essentially the same in terms of information processing. People process and share information for the purpose of taking actions. Then after seeing the results of those actions, they go through the cycle again. These cycles of learning (creating information, then acting, and acting again) are the heart of an organization, and lean organizations drive hard the sharing of information to shorten these learning cycles. Lean organizations work like a communication network, with each process performing a particular task and each sending and receiving messages continuously. This communication network is usually manifested in work cells—a group of interconnected employees co-located to quickly cope with the variety and complexity of ever changing customer demand. Traditional companies, however, instead of allowing the network to speed up information flow, take the opposite approach in trying to cope with variety and complexity. They rely more on adding structure which short circuits the network. If, for example, new technologies are emerging, they reorganize their engineers by technology. If a product is becoming more complex and more and more employees are touching it as it moves through the company, they will increase the number of formal control points. And, when greater variations in mix of orders show up as they try to increase product variety to the market, they typically build inventories and add slack capacity into the system to handle the overload. All of this is costly and slows down the company because additional buffers and capacity are not the answers to meeting the demands of the marketplace. In contrast lean thinking companies cope with variety directly by building up their flexibility and greater capacity for creating and sharing information. Lean organizations go back to basics when they decide how they are going to measure and monitor performance. Time, throughput, and team-oriented metrics are the most important performance measures for the lean thinking company. How do lean companies measure time? They follow two rules: keep the measure physical, and measure as close to the customer as possible. Overall measures, such as time from concept to launch of new products or order lead time, are good places to start. Lean organizations measure the cycle times and lead times of all important activities. They start with cycle times of major activities like new product development, or conversion of raw materials to finished product. Time is more useful as a management tool than cost. Cost is by and large a lagging indicator, a symptom, a set of accounting activities after the fact. Cost is tracked through a set of accounts corresponding to what money is spent on—payroll, inventory holding costs, and so on. Some costs add value to customers, while others are not value-added. Adding cost in the form of better quality raw materials for example, may add value to the customer but many overhead items like rework, inventories, or the cost of other idle assets add cost but no value. Managing time on the other hand opens up the organization for analysis. Time is an objective measure of current flow, not a calculation based on an accounting chart of accounts. A manager can measure and quantify the flow of activities directly and ask with respect to each whether it is value-added. For example, inventories are idle materials, just as in-boxes contain idle information. Reworking is doing something over. Holding up a decision because of a delay in data arrival is response time lost. As these examples demonstrate, time is a common, direct measure. Time’s major advantage as a management tool is that it forces analysis down to a physical level. Developing a time line of activity of what happened every hour of every day to an order, or to a project, or to whatever you want to monitor tells you exactly what goes on in your company. Once physical activity is revealed, the right questions can be asked: Why are these tasks done sequentially and not in parallel? Why do we do this step twice? Why does this process work only 50 percent of the time? Why do we invest resources to speed this process up and then let its output sit and wait on the next process? Answers to these questions lead managers to where the cost and quality problems of the company actually are. Of course, all lean companies use both time and cost measures. Cost is the key to knowing financial performance and to controlling the expenditure of resources. But looking at the organization through a physical lens gives management more insight and power in looking for ways to improve results than cost analysis typically can. In most organizations the less time it takes to deliver a product or service the less it should cost. Lean thinking organizations reduce cost indirectly by squeezing time. When a company attacks time directly the first benefits achieved are usually shorter cycle times, and faster inventory turns. Lower overhead costs usually follow, as the cost of dealing with breakdowns and delays begin to vanish. Lean companies know that if they reduce time they also reduce costs. The redesign of an organization in harmony with Lean thinking helps it identify value and deliver that value to the customer without interruption whenever the customer requests it. In order to deliver this value Lean thinking organizations must make the flow of work from start to finish visible to all employees by investing in comprehensive training and cross training of their employees. A lean organization structures work to reduce time. Management concentrates on flowing work continuously. By creating a smoother, uninterrupted flow, they can reduce the cycle time of the entire value stream, thus increasing throughput capacity. Lean thinking companies create more pertinent information and data and share it instinctively. They cope with variety directly by building up their flexibility and greater capacity for creating and sharing information. Time is a very important metric for Lean thinking organizations because they know they can reduce cost indirectly by reducing time. By attacking time directly, the first benefits achieved are usually shorter cycle times, and faster inventory turns. This is usually followed by lower overhead costs, as the cost of dealing with breakdowns and delays are minimized or eliminated. Willie L. Carter is the president and principal of Quantum Associates, Inc., Highland Park, Illinois. He is the author of the book “Process Improvement for Administrative Departments- The Key to Achieving Internal Customer Satisfaction”, available on Amazon.com. Carter is a Certified Lean Sensei, Certified Manager of Quality/Organizational Excellence, and a Certified ISO 9000 Lead Assessor. Call us (847-919-6127) or visit our contact page for more information on how we help companies do more with less. 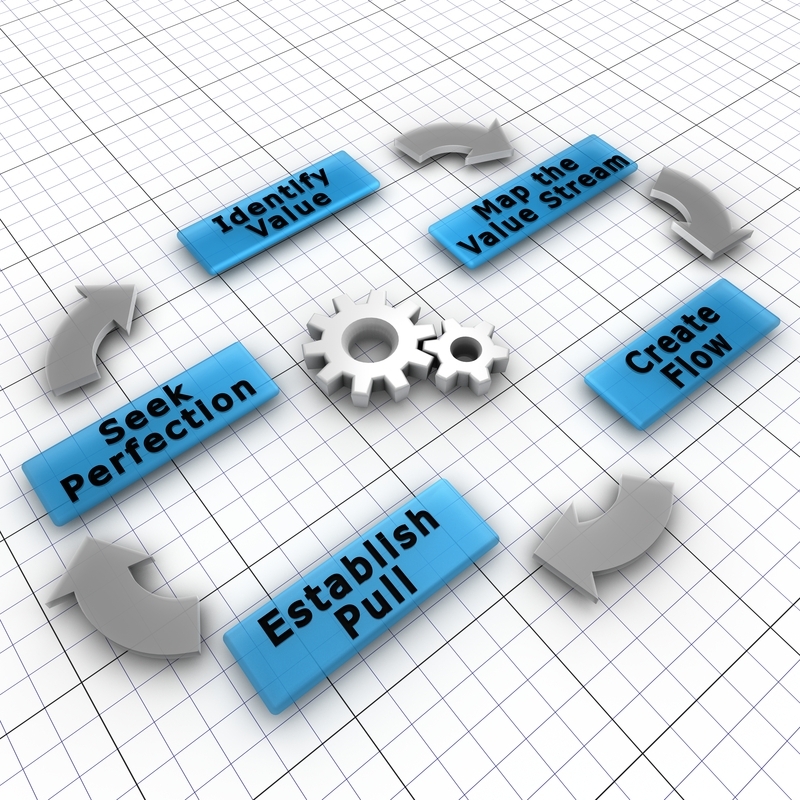 Escape the Planning Loop Trap – Think Lean!